To celebrate the Treaty of Aachen, the Permanent Representatives of France and Germany in Vienna jointly hosted a reception, welcoming representatives from other Permanent Missions and the international organizations based in Vienna. French President Emmanuel Macron and Chancellor Angela Merkel signed a new friendship treaty that is designed to deepen and enlarge the Franco-German bilateral relations, as France and Germany marked the 56th anniversary of the Elysee Treaty. Afghanistan shares the same ideals when it comes to the value and preservation of diplomacy and multilateralism, one of the main priorities of our foreign policy. On Friday, 7 December 2018, Ambassador Khojesta Fana Ebrahimkhel attends the event organized by the Ministry for Europe, Integration and Foreign Affairs on Culturally Conditioned Violence and Right to Self-Determination of Women. On the 16 days of activism in the mark of the International Day for the Elimination of Violence against Women, Ambassador Ebrahimkhel joins experts in a discussion on the issue of cultural conditional violence and the self-provisional law of women. During the event, Ambassador Ebrahimkhel thanked H.E. Minister Karin Kneissl for this excellent initiative on a very important topic for Afghanistan. Violence against women remains a major obstacle to equality and it is an issue of fundamental human rights. In Afghanistan, considerable progress over the past sixteen years has been achieved in the area of gender parity and women’s rights. The Government of Afghanistan has developed important measures in the areas of legislation, policy-making and institution building, such as the approval of law on violence against women, National Action Plan for Women of Afghanistan (NAPWA), Convention to Eliminate all Form of Discrimination against Women (CEDAW), regulations for the prevention of sexual harassment, National strategy on the Elimination of Violence Against Women (EVAW) and the creation of special courts, special prosecution office, commission and assistance centers for the elimination of violence against women. Nonetheless, much more still needs to be done to substantially improve the situation of women in Afghanistan. 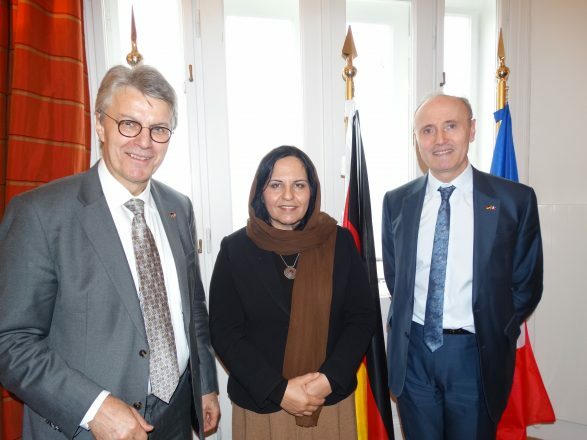 Ambassador Ebrahimkhel, as first female Ambassador of Afghanistan in Austria and as part of her pledge as International Gender Champion, is fully committed to the empowerment of women and to gender equality and will undertake significant contributions to prevent violence and abuse against women. Today, H.E. Idrees Zaman Deputy Foreign Minister of Afghanistan met with H.E. Thomas Greminger, the Secretary General of the OSCE at the sidelines of the OSCE Ministerial Council in Milan. In this meeting, both sides discussed a wide range of OSCE involvement in Afghanistan. Mr. Zaman thanked the Secretary-General for the overall OSCE support to Afghanistan, in particular, the border management training and capacity building programs for Afghan customs officers and Afghan border police. 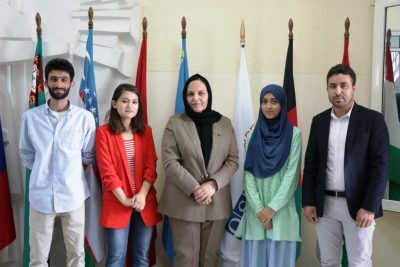 He also highlighted the importance of the OSCE Academy in Bishkek which is annually providing a number of bachelor and master degree programs for Afghan Students. Mr. Zaman also expressed his gratitude for the OSCE observation mission for both the Parliamentary and Presidential elections since 2004 and expressed his willingness to have OSCE observation for the upcoming presidential election of Afghanistan which is planned to be held in April 2019. Ambassador Greminger considered Afghanistan as an important country in terms of its geopolitics and promised to keep Afghanistan high in the Agenda of OSCE. He also talked about the new OSCE strategy for Afghanistan where the OSCE will broaden its involvement with Afghanistan. Today, H.E. Idrees Zaman Deputy Foreign Minister of Afghanistan met with H.E. Karin Kneissl Federal Minister for Europe, Integration and Foreign Affairs of the Republic of Austria at the sidelines of the OSCE Ministerial Council in Milan. In this meeting, both sides had fruitful discussions on issues of mutual interest, including Austrian’s long and sustainable support to the government of Afghanistan within the OSCE’s framework and in other regional and international organizations, the reopening of an Austrian embassy in Kabul, moving the Austrian Non-residence Embassy from Islamabad to Delhi in order to facilitate the visa procedure for Afghan applicants and lastly the issue of Afghan migrants living in Austria. 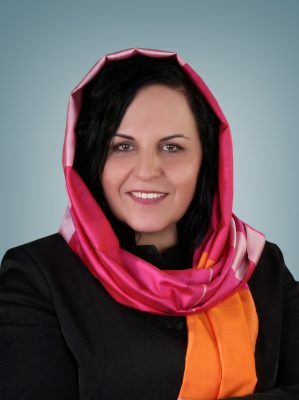 The Foreign Minister expressed her country’s full support with the people and government of Afghanistan in this crucial time and promised to welcome any new initiatives to extend the roots of cooperation between the two countries. 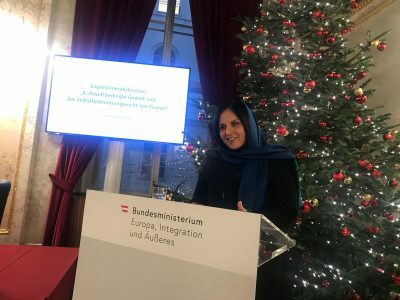 She also touched upon Afghan asylum seekers who are entering Austria to get permanent residence and wished to have Afghanistan’s support in easing the procedure for Afghan deportees whose asylum applications have been denied due to criminal records. 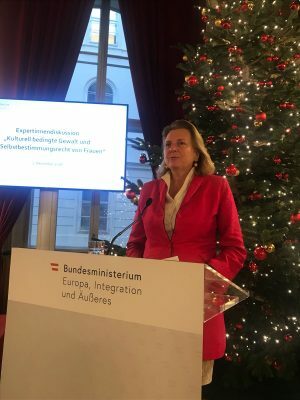 She also emphasized that the government of Austria would consider all international laws and norms, as well as the current security situation in Afghanistan, in their migration policies and legal acts on migrants. H.E. 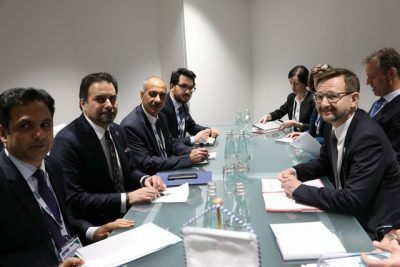 Zaman appreciated Austria’s longstanding support to Afghanistan in various areas and in particular, their active presence within the Resolute Support Mission in Afghanistan. 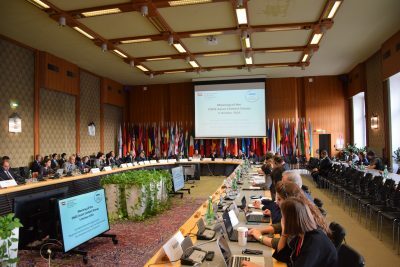 The Embassy and Permanent Mission of Afghanistan in Vienna along with the Austrian Mission at the OSCE Co-chaired the Asian Contact Group Meeting on “Regional Connectivity, Trade Facilitation, and Women Empowerment” at the Hofburg Palace in Vienna. In this meeting, panelists shared their views and comprehensive presentations on Regional cooperation, inter-linking regional platforms for promoting trade and regional connectivity as well as empowering the role of women in the social, economic and political sector.